June 1st is coming up in just a couple of days, for some people out there, they will be affected by the few big changes that was planned a long time ago. A new Clipper card will cost $5 each for all adults starting June 1st. The blue cards have been given for free for nearly a year, and the free cards will come to an end after May 31st. During the 'free' card period, a person must purchase a minimum value to get the free card, such as $5 in e-cash or a transit pass. Since the new $5 fee is not a deposit or a credit to one's Clipper card account, it is unknown if a passenger must still load a minimum card value on top of the $5 fee. Clipper cards for all youth & seniors will still remain free. UPDATE: One of my fellow bloggers is questioning when the card fee may expire. My news sources from many months ago says: "...through June..." which could be interpreted as June 1st or June 30th (last day of fiscal year). If a Clipper representative is available, please inform me in the comments section on the OFFICIAL last date. Thanks. Starting with the June 2011 Muni pass period, senior passes are only available on senior Clipper cards. Seniors who did not obtain a Clipper card can receive one immediately by going to one of these sign-up locations. Remember to bring proof of age to demonstrate to the staff member that you are eligible to receive the grey colored card. For all sign-up locations this week, click here. Clipper customer service at Embaracadero Station & Bay Crossings at SF Ferry Building. SFMTA customer service center at Market & South Van Ness (SW corner). Presidio sales booth at Geary & Presidio (across from Office Depot). Muni has given San Francisco's youth a little break on switching to Clipper. The last paper "Y" pass will be sold for the month of July and will go Clipper only on August 1st. While the last paper pass will be July's, Muni will slash the number of locations where the youth pass will be sold for the July pass. 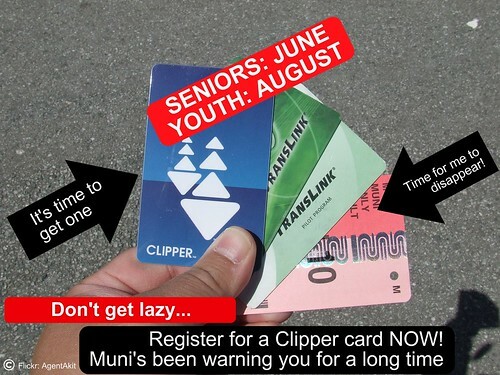 Only 11 Muni pass outlets will sell the July paper pass, thereby encouraging all youth to start applying for their customized youth Clipper card as soon as possible. See list of the 11 retailers by clicking here. June paper passes will be sold at all Muni pass retail outlets as usual. To sign-up for a youth Clipper card, complete the application form before arriving to a sign-up location (click here for application form; PDF file) and bring proof of age to the sign-up location. The form cannot be mailed to Clipper customer service or Muni, and must be submitted in-person. A parent or guardian can submit the form without the youth's presence by visiting Muni's customer service center at 11 South Van Ness (Bank of America building). Make sure to bring a COPY of the birth certificate. SFMTA customer service at 11 South Van Ness. Clipper customer service at Embarcadero Station. Clipper customer service at the Bay Crossings Booth in the Ferry Building. Note: SFMTA did not clarify if the youth must be present at the Clipper customer service locations in order to obtain a card. For other sign-up locations this week, click here. Be aware, the representative will only accept the application, and Clipper will mail the youth card within 10 days. If the youth passenger will also be getting an AC Transit monthly youth pass, you must register for a new youth Clipper card at AC Transit's ticketing office. AC Transit has a unique policy where the youth Clipper card will also include their photo and the card's chip is programmed to allow purchasing of the AC Transit youth monthly pass. Youth cards issued by other transit agencies or the Clipper customer service centers will not allow purchasing of the AC Transit youth pass, but will still honor the youth e-cash price for single rides. If you are wondering, why can the SFMTA customer service office and the two Clipper customer service locations are able to issue youth cards on the spot? The reason is they have the computers to enter the youth's information into the database (to prevent people from getting more than one card under their name so they can share the extra card(s) with adults) and they have special card reader devices to program the youth card with the youth's birth date. Inputting the youth's birth date is important as the youth card will automatically turn into an adult card when the person reaches the age of 18; however, BART has a policy at 12 years old when the discount price is not applicable and must be charged the regular adult fare; thereby if a youth passenger is between the ages of 12 and 17, BART will be full adult fare, but other transit agencies will charge the youth rate. When you submit an application at other locations such as a special sign-up table at a festival, the card cannot be issued because they don't carry the hardware needed to issue new cards. So why can Senior cards be issued on the spot at all sign-up locations, including at festivals and temporary sign-up tables? The main reason why they can issue Senior cards is because they don't need to be individually customized, unlike the youth cards. The general rule is seniors must be at least 65 years of age or older to get the senior citizen discount price to ride transit, thereby if the applicant shows they are 65 or older, they can get a card on the spot. Clipper will soon later process the application to verify if the passenger is not in possession of more than one card under their name. So Clipper has found another way to make a profit, at $5 a card? I'm so confused..... but the Walgreens lady did successfully load my wageworks check to my July pass, even when I wasn't quite sure she did it right! Not really a profit. MTC has to buy the cards to supply to the public, so after the free year period, they are getting reimbursed for the multi million dollar cost. Prior to Clipper, TransLink cards was also $5 a pop to obtain. Some customers brought our attention to this post about the card fee. No formal date has been set for the return of the card acquisition fee yet. Please keep an eye on our Facebook and Twitter - we'll let everyone know when there is. You might want to chat with the SFMTA, there's still signage at the metro booths about the start of the $5 acquisition fee. So Muni made us switch to Clipper (which I was glad to do back when it was still in pilot) and now, in addition to the elevated fares they are charging we get charged a fee on top of it? And the only way to avoid the fee is to use the slow and inconvenient method of paying a cash fare. It sounds like even if you load your card with a pass there is an extra fee - is that right? We shouldn't be charged a fee for something they are requiring us to us. Also, I got an email a week ago from Wage Works informing me that Clipper is now charging $2 a month for direct load of the pass onto my Clipper card. Instead I have to keep track of yet another credit card in my wallet and remember to stop by the machines each month and hope they are working. My fast pass just came in the mail each month and I wasn't charged a fee for the privilege. I was a huge fan of this product but frankly I'm really pissed off that they've managed to make getting a pass more inconvenient and expensive. I don't like the idea of a $2 monthly fee to have passes directly loaded from agencies like WageWorks and Commuter Check. It's really annoying and dumb for people to get a debit card or paper vouchers as an alternative. I normally use a debit card for flexibility, especially if I may be going on vacation, I'd either save the funds or utilize the card by converting it into e-cash. Another alternative is to get paper vouchers as they are accepted by different vendors than the debit card.